At first, anyone can easily dismiss that these entrepreneurs are misfits for their business, but be inspired by how they prove otherwise. There is nothing about The Girl + The Bull that looks like it was bound to be one of the year’s most successful, most talked-about restaurants. Everything about it was wrong, starting with its location, at an overlooked corner of a suburb south of Manila. And no one would have picked out Gab Bustos for a culinary genius: He had dropped out of a Fine Arts degree, and had no kitchen background at all. Neither did his girlfriend, Thea de Rivera, who herself had shifted out of a management course in college. What they did have going for them, however, was a shared love of food and of travel, endless support from one another—and a stubbornness that told them to keep going. So, when the restaurant at a bed-and-breakfast owned by Bustos’ family closed, the couple grabbed the opportunity to try striking out on their own. Modeled after some of the LA restaurants the couple admired, The Girl + The Bull opened quietly at the end of 2013, with Bustos offering a menu of modern cuisine, and de Rivera running the front-of-house operations. Their insistence on quality first has paid off, in more ways than one. The restaurant is an unqualified success, the couple are now stars in the culinary scene—and they’ve managed to become role models for other young people. “I had the mom of one of our staff call to thank me for teaching her daughter the value of work!” laughs de Rivera. 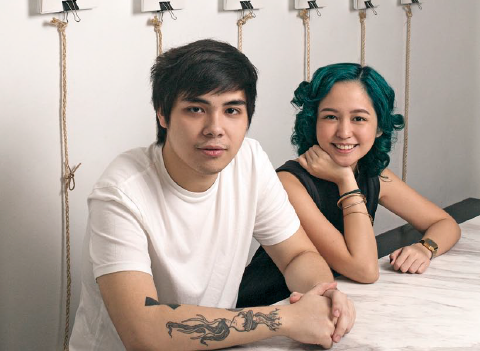 Even better, the couple have begun showing off their new project on social media—a second restaurant, called 12/10, in Makati. This article was originally published in the October 2014 issue of Entrepreneur magazine. Subscribe to the print or digital version here.